eBay vendor antiques143 has a couple of pieces on offer that display a distinctive mille fleur pattern likely to have been the work of one particular artist or small workshop. 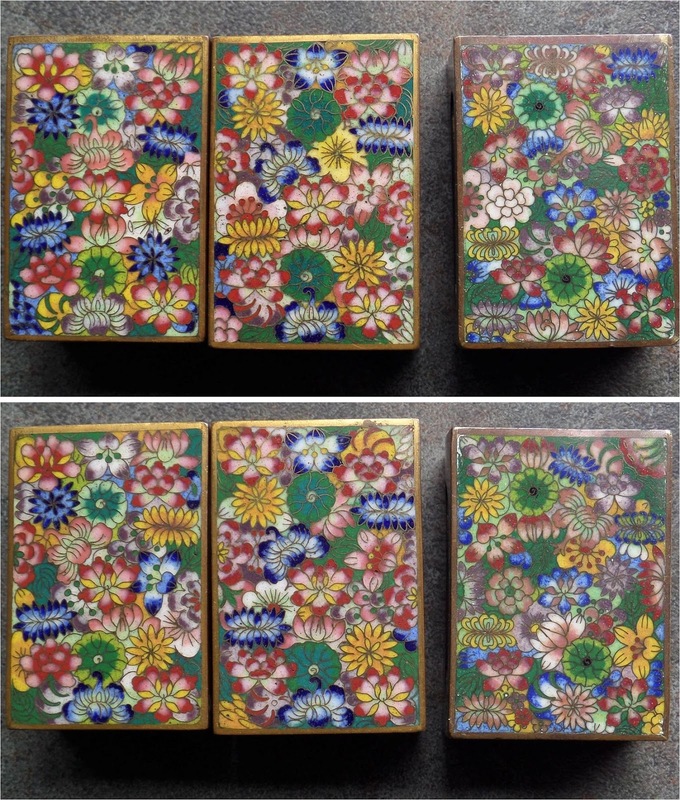 I have 3 matchbook covers in this pattern: a pair apparently made at the same time, and one other which is similar but a bit smaller and with a slightly different arrangement of the flowers. 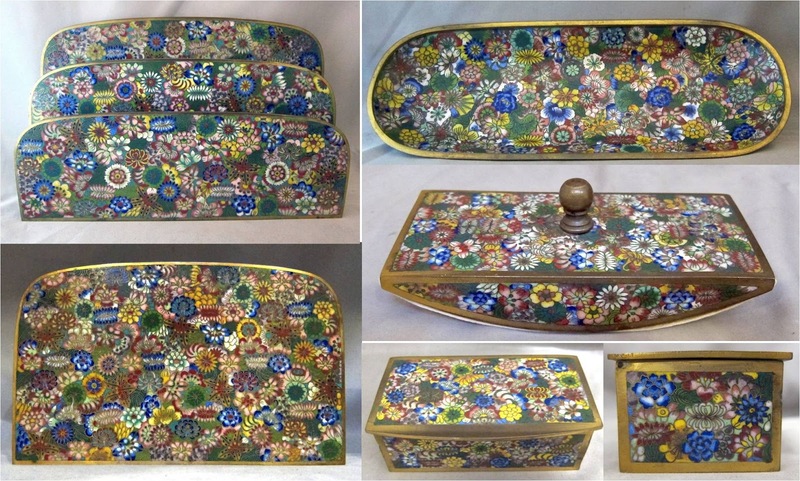 Identical wirework in the flowers & similarity of placement in the composition, different enamel colors and background motifs according to whim. The artist was working freehand, not tracing a drawing. The wirework is very tiny and fine. This unique design style appears on other pieces that seem likely to be from the 1890s-1920s decades - unless desk sets continued to be used through later decades as well? Matchbox, desk set, and jar featuring what look like identical floral motifs. Pieces from a different desk set featuring this pattern. By way of comparison, a desk set with the signature of Lao Tian Li. Letter holder from Lao Tian Li desk set. The fine, paper-thin wire and tiny detail of these millefleur pieces made me wonder why such tiny patterns were not also applied to beads? Or perhaps they were? 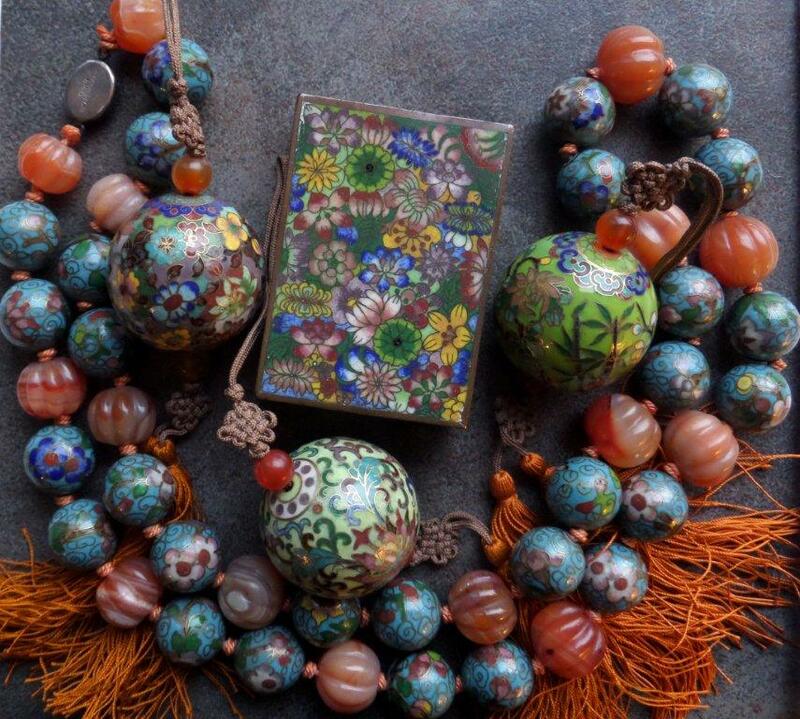 Large beads strung as ornaments, beads featuring a style of background cloud motif common in the 1930s-40s. The floral motifs on the beads are different from those on the matchbox, but the wirework - especially on the large ornament beads - is just as fine and precise. The 1935 flyer from the Decheng workshop mentions beads as one of their varieties of cloisonne products. Cloisonné beads that appear in costume jewelry designs from the1930s seem to vary between graceful artistic compositions as in the white beads below, versus a more splashy folk-art look as seen in the oval beads suspended from the silver filigree roof brooch. 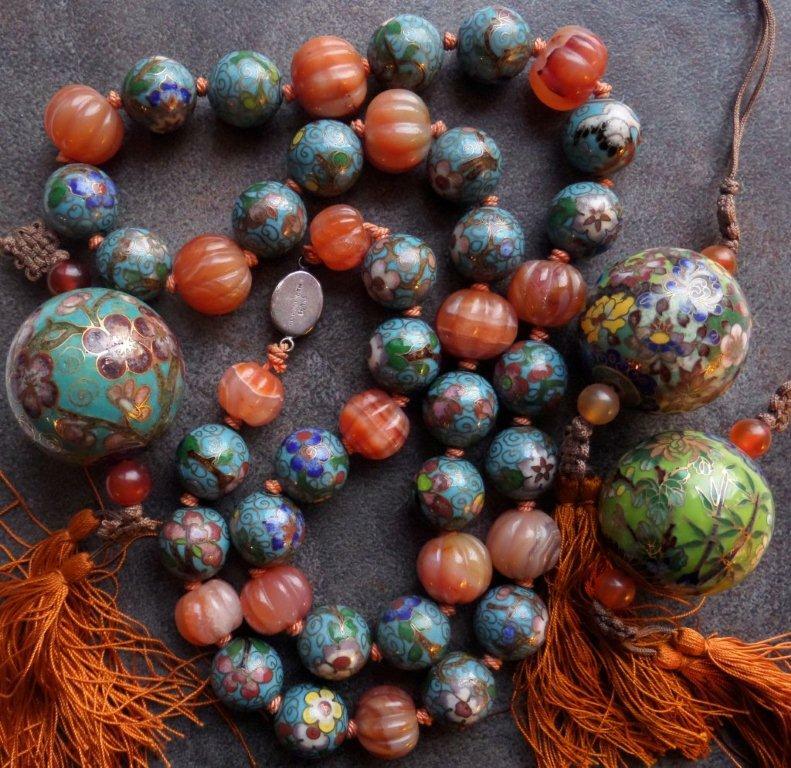 However, there is another cluster of cloisonné bead jewelry designs that are obviously of Chinese manufacture: classic necklaces combining fine cloisonné beads with gemstone beads made from carnelian, rose quartz, tigereye, and jade, often featuring filigree box clasps with a "Silver Made In China" stamp. One bead features an old-fashioned version of the red-crowned crane motif. 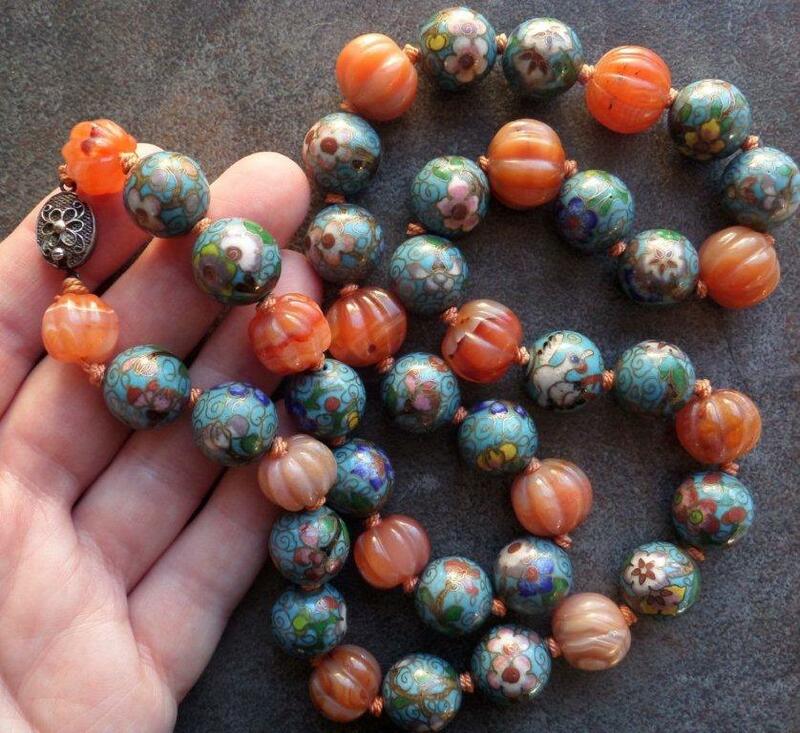 A carnelian and cloisonne necklace from Germany whose former owner informed the auction agent that it was purchased in China during the 1930s as a gift to her mother. Clasp from the necklace pictured above. 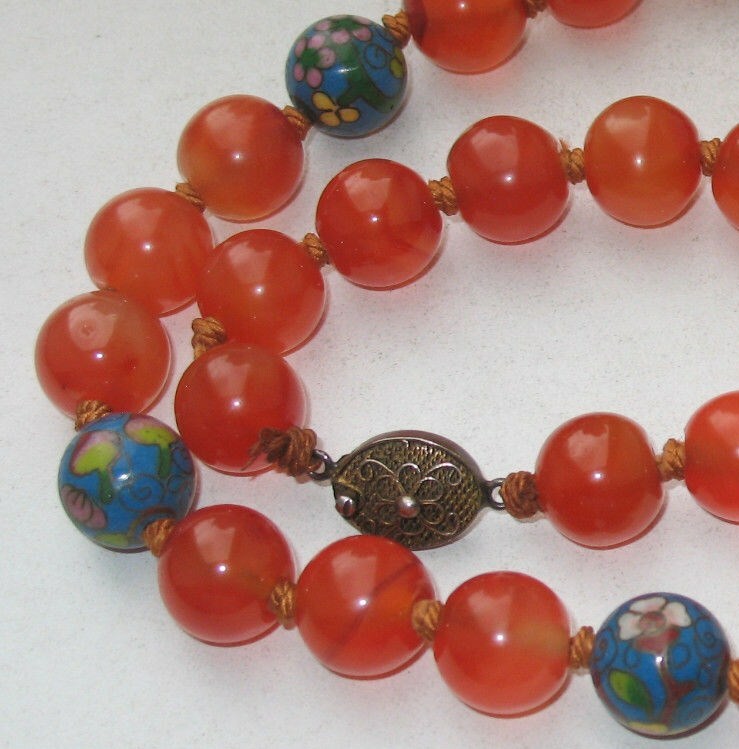 Another carnelian and cloisonne necklace. 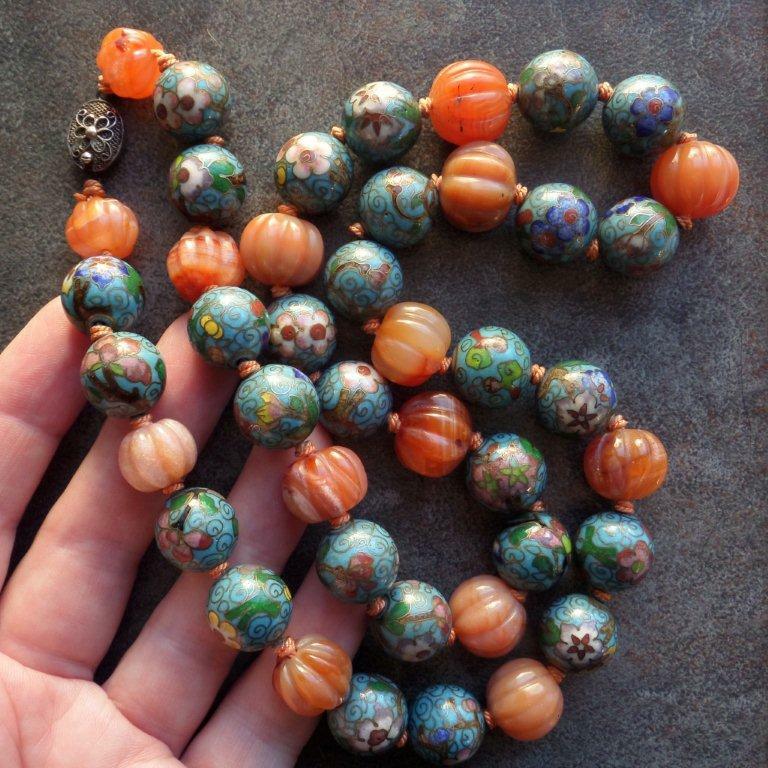 According to her daughter, the deceased owner of this necklace considered it an heirloom. Unlike necklaces featuring mass-produced beads of identical design throughout, perhaps these necklaces might be better interpreted as suites of similar beads – as if an artisan turned out a small collection of beads on any given day or week that, according to personal whim or inspiration, explored a variety of motifs tied together via a matching background color and size. 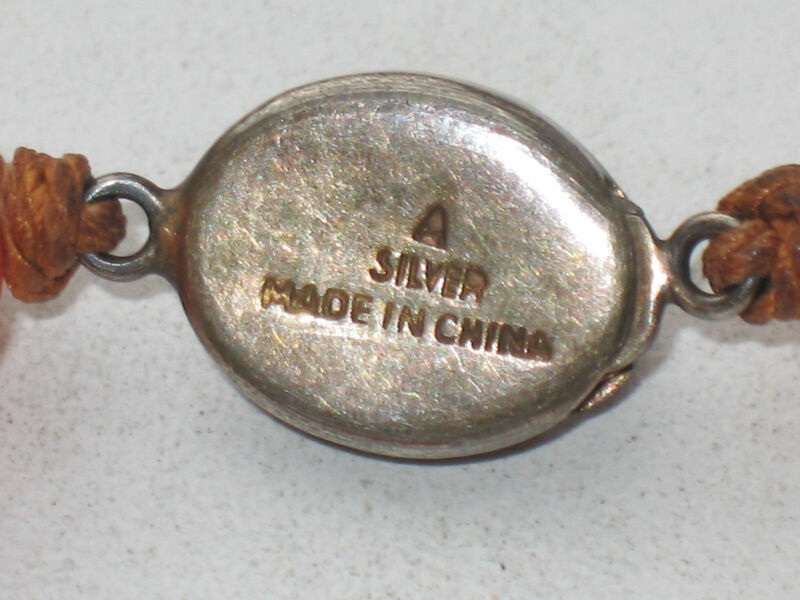 These small matching series were then strung with complementary gemstone beads, either using knotted silk or a wire loop chain technique. No two necklaces are ever exactly the same, because each uses a separate small suite of beads, not identical beads from a box of 200. 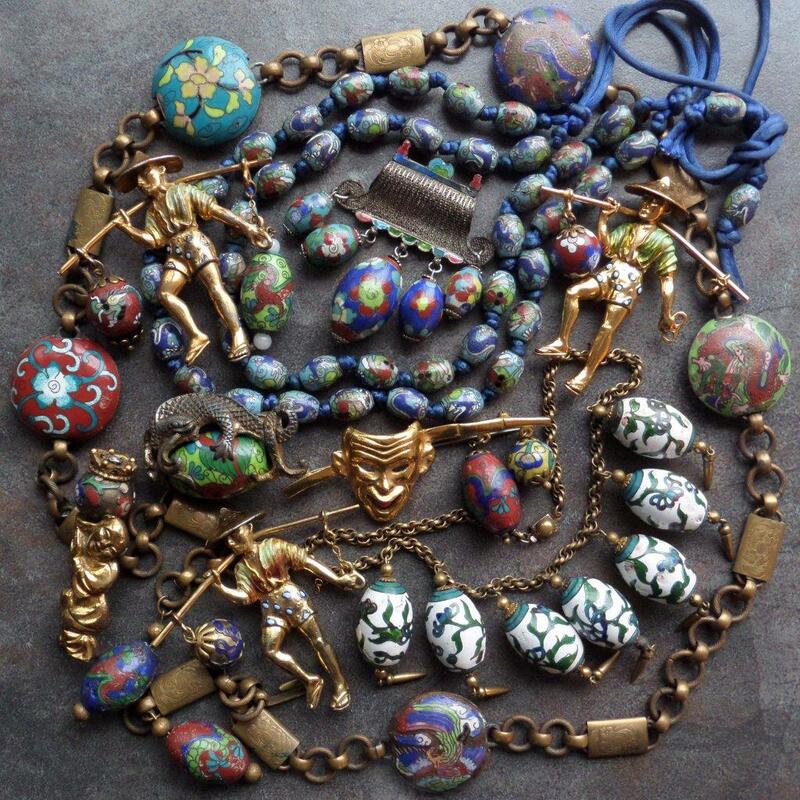 Were these nicer beads and necklaces in fact made during the 1920s-40s decades? What do you think? 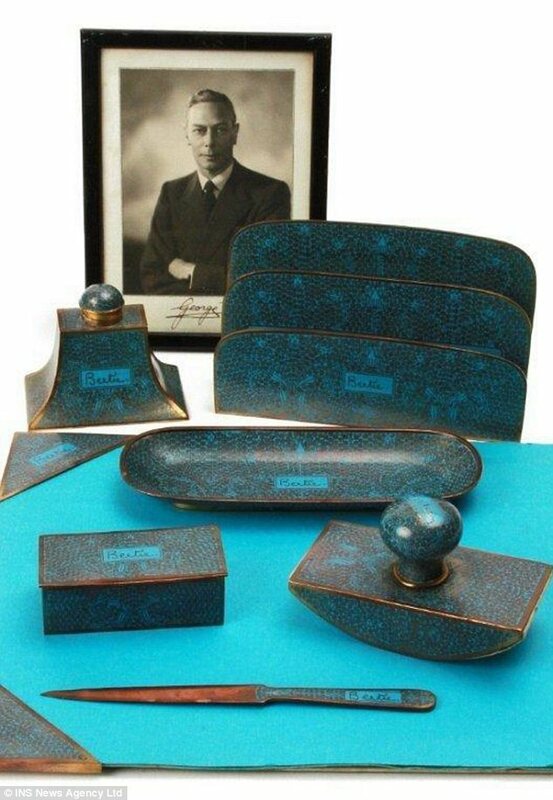 UPDATE: This 2012 Daily Mail article features a 1936 desk set given as a gift from the Duke of Windsor to his brother the King.